One of Duke’s most lauded alumni, Robert E. Fischell E’51, developed more than 50 spacecraft for the United States Navy and NASA before turning his attention to biomedical devices in 1969. 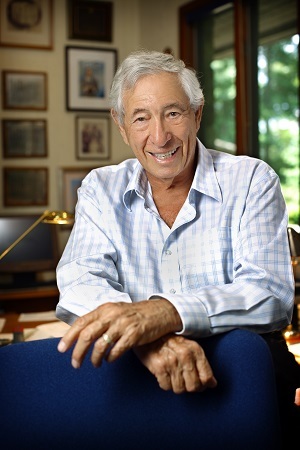 Since then, he has launched 14 private companies, and holds more than 200 US and foreign patents that have been the basis for medical devices including heart pacemakers, defibrillators and coronary stents that have been implanted in more than 20 million patients worldwide. 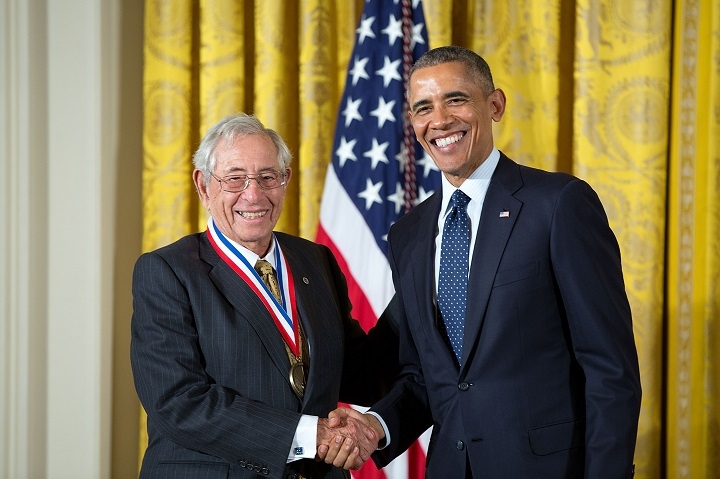 Among his many honors are Inventor of the Year for the USA (1984); election to the National Academy of Engineering (1996); Discover Magazine’s Technology for Humanity award (2004); the TED award for contributions to medical technology (2005); and the White House’s National Medal for Technology and Innovation (2013). Just ahead of delivering the first Duke MEDx Distinguished Lecture in fall 2016, Fischell talked with us about his career at the intersection of medicine and engineering. How did you get interested in science and engineering to begin with? I was brought up in the Bronx by a father who didn’t finish the 8th grade—he was an immigrant from Lithuania. My mother was an immigrant from Minsk, and she was the family hero because she went to high school. My father was a shoe salesman, and my mother ended up being a bookkeeper. But there was a love for learning in the family. It was always told that the best thing you can do in life if you want to make something of yourself is to get a good education. Why did you choose to go to Duke and what was it like? When I finished high school, the time had come to go to college, and I noted that Duke had a very good reputation. Not nearly as good as it has today, though, and some people say it got much better after I left and that there was a correlation. But I deny it. Duke was great for me. It was beautiful. It was friendly. I enjoyed the intellect and the sports. I loved everything that there was. I studied Mechanical Engineering, but I found that the easiest course for me was physics. I thought it was such an easy field that I’d try to make a living at it. Where did you go after graduation? I loved physics so much that I went on to the University of Maryland where I got my master’s in it, and I finished all the coursework for my doctorate, but I got so busy that I didn’t write a thesis. They granted the degree to me though many years later as an honorary degree. I didn’t have any specialty in physics, but I’ve applied it as an inventor. I worked at the Johns Hopkins University Applied Physics Laboratory for 32 years designing spacecraft for the United States. I have 30 patents on spacecraft, and I even taught at the University of Maryland in the graduate school, where I taught the elements of space technology. What are some of your most memorable achievements in spacecraft? You’ve heard of the GPS satellites? Well, the precursor was called Transit. It was a navigation satellite that just does exactly what GPS does, but it does it using about four different satellites that go around the planet. I probably had 20 patents on the design of those satellites, and many are still in orbit being used for research. I also did a lot of research in magnetism. I convinced NASA to spend tens of millions of dollars on MagSat, which precisely defined the Earth’s magnetic field. I was the first one to invent aligning the axis of a satellite along the Earth’s magnetic field so that one side wouldn’t get too hot while the other got cold. Then I invented how to remove the last bit of spin out of a satellite by using magnetic rods that rub against the Earth’s magnetic fields. It’s interesting how much I’ve dabbled in magnetism. But at some point you got into biomedical devices. How did that come about? I was reading an electrical engineering magazine and saw an advertisement for a heart pacemaker. It said that the batteries were so good that they last as long as two years. Well I looked at that and said, “It only last two years? And you have to put a new one in through surgery every two years?” So I called Johns Hopkins and asked a doctor if it does really last only two years. He said no, that’s not true. It only lasts 14 months. So I said I’ll tell you what I’ll do. In one week’s time I’ll bring you a working, rechargeable heart pacemaker one-quarter of the size that will last the patient’s lifetime. So I got my engineers, who are brilliant satellite engineers, and they made the first rechargeable heart pacemaker. That’s how I accidentally got into medical devices. You never can tell what will happen if you don’t mind your own business. So you pivoted into the biomedical realm for the past three decades. What are some of your most memorable achievements? I was co-inventor of the heart defibrillator and coronary stents. I invented a device (approved two years ago by the FDA) that senses epileptic seizures before they happen and turns them off. I invented a device that tells that you’re having a heart attack before you have any symptoms. It alerts you and sends heart data to the nearest hospital and registers you there. I invented another device that creates intense magnetic pulsations onto the brain, which erases migraine headaches. That one is now FDA-approved and is already in use by a few thousand people and growing. Now I’m working on a technique putting intense magnetic pulsations into the human body, where they turn into electrical pulses. We’ve discovered that electrical pulses on pain neurons prevent them from sending the exact message for pain to the brain, so the body thinks there is no pain. At the moment, the medical school at the University of Maryland in Baltimore is conducting clinical trials to use this magnetic pulsing technique to relieve lower back pain. We’re also going to use it for relieving the foot pain from diabetic neuropathy and cancer chemotherapy. My goal is to use these intense magnetic pulsations to erase or at least reduce most human pain with no drugs or side effects. I think there’s an opportunity there to have a great company that can help millions of pain patients throughout the world. It sounds like you’ve worked with licensing technology and starting companies a lot in your decades of work. Is that difficult? I’ve started 14 companies and my patents have been licensed through Medtronic, Johnson & Johnson, Abbott Laboratories and Boston Scientific. That names a few of them. So I guess they got around. But every time, they will not give you any support until you have absolutely proven that it works and you have FDA clearance. So it is a very difficult thing to succeed in the medical device business today. I saw a statistic recently that said that 9 out of 10 startups fail, and that doesn’t surprise me. It’s not an easy field. But it’s an important field? Engineering in medicine can provide some of the greatest advances in medicine. In my opinion, an incredible part of the future of medical care for human beings will be by joining advanced engineering with medicine. One hundred years ago there were essentially no medical devices, and now I’m sure there are at least 100 that are having a dramatic effect at improving human life every day. Also, medical devices act locally as opposed to drugs that permeate the entire body and have many adverse consequences. Medical devices do not have those adverse consequences, and so they can be extremely effective. You’ve had a tremendous impact on human life. What is it like, at 87 years of age, looking back on your ongoing career? It has to make you feel extremely good, after a lifetime of work, to make new medical devices and spacecraft to help mankind. Of course, to me it is always an opportunity that can create truly satisfying results. I hardly ever have to “work.” All I do is create inventions, make companies and design new things for people. And to me it’s a great game. If one can apply the knowledge that one gained at Duke University to benefit mankind and yourself, that’s as good as it gets. You might quote me on that.